Some days, I’m too involved in my homework to realize that it’s past time to start making dinner. Usually dinner doesn’t take too long to make and I can still manage to get it on the table by our normal time, but not always. It’s worse with recipes like this one that call for more than an hour of cooking time. Luckily, my wonderful husband has taken to cooking as a duck to water and he picked up the slack the other day so I could concentrate. 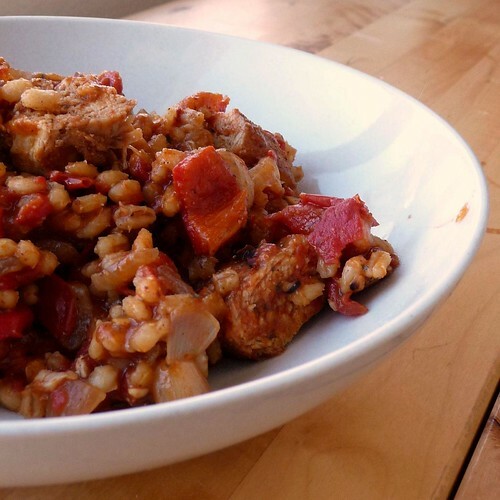 He chose to make Spiced Chicken with Barley from one of our Cooking Light collections. I started reading the magazine a few years ago and, while I don’t subscribe any more (mainly because I already get two great recipe magazines and would only fall farther behind in making all those nifty dishes with a third), I found that their recipes are fairly consistently delicious and can be easily modified to suit my taste. One in particular, Cooking Light Superfast Suppers: Speedy Solutions for Dinner Dilemmas , is still my favorite, but today’s recipe comes from The Complete Cooking Light Cookbook . I don’t often cook with this combination of spices nor do I often make barley for our starch/carb of the meal. I think that is going to change! 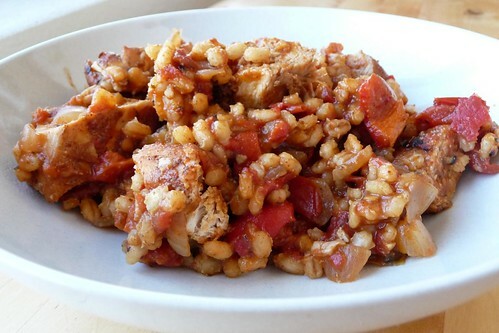 Barley is definitely underutilised, despite being high in fiber and having a tasty, chewy texture. I loved the combination of the spices with red peppers and tomatoes which gave a very warm, hearty and intense flavor. Definitely a keeper. One of the best things about this dish is that it can be very easily adjusted to suit vegetarians. The chicken is good but it’ s not essential by any means — exchange it for some cannellini or great northern beans, even lentils, and you’ll have a great dish. Combine spices (first 7 ingredients) in a small dish and rub well onto chicken. In a large skillet over medium-high heat, add oil. Add chicken and cook about 3 minutes per side until browned. Remove. Add onion and cook for 4 minutes. Add bell pepper and continue cooking for another 2 minutes. Stir in soy sauce, broth, barley and any leftover spices. Let stand for 10 minutes before serving. Garnish with green onions if desired. This entry was posted in american, chicken, dairy-free, gluten-free, indian, one-dish, recipes, salad, untranslated, vegan, vegetarian. Bookmark the permalink.